Denny Jump (Bellevue, WA, United States) on 6 August 2010 in Landscape & Rural and Portfolio. A few days ago I noted that friend and fellow Aminus3 Photographer, Ms Julie Finley (http://juliefinley.aminus3.com/) told me about this beautiful Nature Preserve which is very near where we both live. In the coming days I will present some of the impressions I have gathered from this wonderful location. It truly is a gem. I was raised in the west (Colorado/Northern California) and I think many people may have an impression of New Jersey that really does not fit.New Jersey is definitely one of the most drop dead gorgeous states I have seen. Rolling hills, Forests, Farmland, green green green. Yes the major citioes can be visually trying, but that is a small part of New Jersey. For the most part, it isa very beautiful state. The very same thing goes for Pennsylvania which is beautiful, as well and I plan to focus on that later on. stunning colors and reflections on this well framed shot! They don't call it the Garden State for nothing. I have family living in Princeton, used to live in NY. The north east is incredibly beautiful. And so is this spot! The placid glassy water and those excellent reflections are fabulous! @Bettina: Yes I agree Bet. Julie (of Easton) says that it is her spot to re-energize and I can certainly see why after having been there. I will be returning. thanks very much good friend! @Skyriani: Hi and thank you so very much. I really like your blog page, quotes, advise, suggestions for reading and and all the rest - thanks very much for your comment. This is an excellent shot Denny. Love everything about it ! @Nigel: As is yours for today Nigel! Thank you so very much. Have a great weekend hopefully with that grandaughter - I have one on the way. @Tamara: Hi Tamara - Thank you very much - I just loved this little cove and the wood when I came upon it. Have a wonderful day. @Scene by Sharon Photography: Hi Sharon - Thank you very much I was lucky to be there at a good tiome, too. Very nicely framed, Denny. Good choice to not include the sky, since it looks to be gray. Good composition, Denny! I like the dry trees and their reflections, the warm tones of the bark, contrasting with the cold green/blue tones of the water and the forest on the background. Nice light, and nice capture! @oriol: Hi Oriol - Thank you very much You make a =good comment about the contrast of the water and the dry trees also. Thanks again and have a good day. giving a surreal appearance to the bottom of the photo. Beautiful reflection in water. Great colors ! @MARIANA: Thank you Mariana - I was lucky with the light. 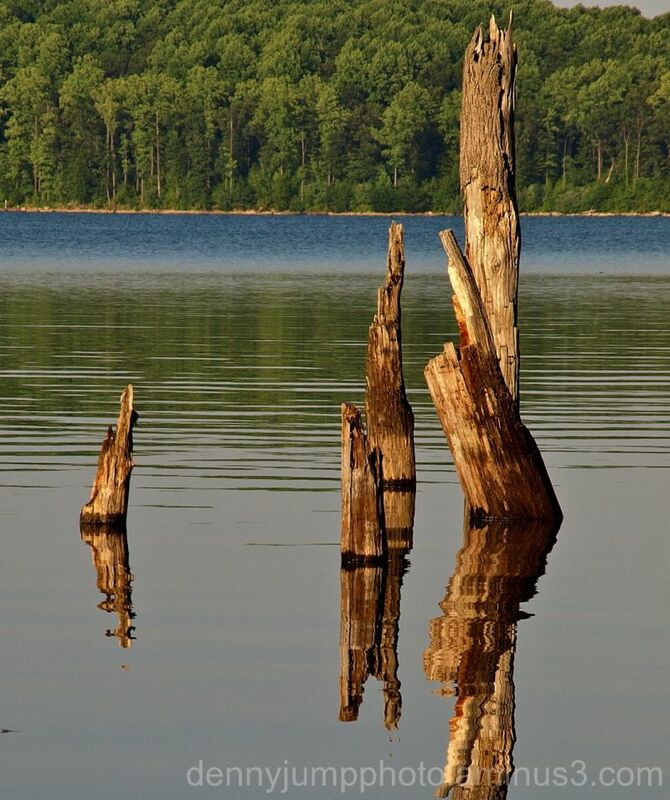 Warm light on dead trunks and their reflections is delightful. Like the quietness of the scene. You captured these so nicely Denny! It isn't easy to get this kind of lighting there! You must have been there at just the right time of day! Awesome reflection!!!!!!! P.S. thanks for the recognition too pal! @Julie: Hi Julie and thanks for putting you comment back up :-) I was there in the evening actually this was a few weeks ago....I plan to go back mornings and evenings as best I can - this seems to be definitely a golden hour location ya know? I will gladly give profs to you until the cows come home for the nice things you have done for me! Superb compo, reflections are magical. Good day. @Tede: Hi Tede and thank you very much - it is a pretty place. This shot is simple and dramatic...well seen to select this from what I am sure was an overwhelming landscape! @Shar: Thank you very much Shar. The original was a bit more "busy" I will admit but I also liked this version bettere. keep it simple as they say. thank yu for finding my blog! Very very beautiful composition, light and colors. Great shot. @Marie LC: Hi Arie and thank you very much for looking at my blog - I really love your photo today - thanks again! Great reflections and composition. The photo jumped right out at me. This is a gorgeous image. I'm a sucker for reflections and these are super. Love that wonderful composition and warm light, too. @Steve Rice: Well I really messed up my response to you -I will just say thank you very much and try again next time :-) Thanks Steve! @k@: Hi Karine - Thank you very much - it is a very pretty location that is for sure! wow - a fabulous image! Just stunning! @alex centrella: Thanks Alex - May I say your Golden Gate is absolutely outstanding!! Wow! I love the clarity and detail captured here and your DoF works well here. The characteristics of the water and how it goes from a clear, reflective surface to a non-reflective blue surface is bewildering. This is a fantastic image in every way. The composition, colors and the reflections are all outstanding. @Bill Brown: Thank you so much Bill - I really appreciate your comments. Such an exquisite shot of the water and trees (what's left of them), and of course the reflections. Just stunning.